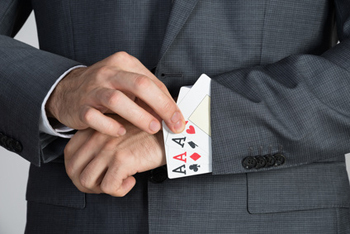 Why are we surprised when a magician correctly guesses cards picked from a deck, as in the trick shown in the video? Is it really that difficult to perform such a trick, or could it just be down to chance? The answer is most probably not, as the probabilities are vanishingly small. In this article we will do the basic calculations and we'll also show that whenever you shuffle a deck of cards you make history: chances are you produce an order of cards that has never ever occurred before in the whole, long history of the Universe. A deck of cards has 52 cards, divided into four suits, two red — hearts and diamonds — and two black – clubs and spades. Each suit has 13 cards: Ace, 2, 3, 4, 5, 6, 7, 8, 9, 10, J, Q, K.
If you choose a card at random, there are 52 possibilities for what you might get. So, if a magician were to simply guess what card you have picked, there would be a chance of only 1/52 they guess it correctly, or a little less than 2%. That means that if a fake magician repeats the same guessing trick around 100 times, they would be expected to guess correctly only twice. The audience would be quite frustrated by the other attempts! so guessing two cards correctly is a much more impressive trick. This is the multiplication principle: the probability of two independent events (guessing two cards correctly) is the product of the two individual probabilities. 1/52 x 1/51 x 1/50 = 1/132600 ≈ 000000.8. 1/52 x 1/51 x 1/50. Is it the first time ever in history that the cards are displayed in this exact order? Unfortunately, there is no way that you could guarantee the answer. However, chances are that you are holding a never-ever-made sequence. Pretty amazing, huh? How can we say this? 52 x 51 x 50 x 49 ... x 2 x 1 = 8.07 x 10 67. If we were to write this number out in full, it would have 68 digits. This is an incredibly small probability. To show just how small it is, let's make our own metaphor. According to the Big Bang theory, the whole Universe was created about 13.7 billion years ago. Also, as of right now, population of Earth is 7.5 billion people. Now imagine a parallel world with 10 billion people who all live forever. Give one deck of cards to each person (it doesn't matter if the person is a newborn or elderly) and ask them to shuffle once per second for the next 14 billion years. Also, consider that each year is a leap year (366 days). Further, assume that for every shuffle a completely new sequence of cards is created. How many new combinations would be created in this process? But this number is less than a billionth of a billionth of a billionth of a billionth of 1 percent of the number of possible card sequences, 52 x 51 x 49 x ... x 2 x 1. Thus even after 14 billion years of shuffling, our parallel world would only have produced a tiny fraction of all the possible combinations of cards! Ricardo Teixeira is a mathematician at the University of Houston-Victoria. He has been actively working in developing rigorous mathematical explanations for magic tricks and other recreational activities. So far, he has published and worked in relating advanced topics such as probability, the theory of cyclic groups, linear algebra, coding theory, algorithms for data transmission, and more, with magic tricks. To this date, over 2,000 students have witnessed him perform and explain his "mathemagics" tricks. Gisele Teixeira is a second grader and gifted and talented student at Dudley Elementary. She has appeared in several YouTube videos performing mathematical magic tricks and explaining college algebra material. She has also helped her father explain logarithms and matrices to college students. 1/52 x 1/51 x 1/53." Thank you for pointing out the error! We've corrected it. 1/52 x 1/51 x 1/53. Likewise, thanks for spotting the typo! I correctly guessed 3 cards in a row that my friend was holding. Nothing more than seeing the card in my mind. No trickery involved. I've practiced this alone by picking up random cards that were face down.